Transients or surges on the power system may originate from switching or lightning. These surges set up traveling waves in the transmission lines. These traveling waves may reach the terminals of expensive equipment in power system and may cause damage to it. This amount of damage caused by surges not only depends upon the amplitude of the surge but also upon the steepness of its wavefront. The steeper the wavefront of the surge, the more the damage caused to the equipment. To reduce the steepness of the wavefront of a surge generally, surge absorbers are used. A surge absorber is a protective device which reduces the steepness of wavefront of a surge by absorbing surge energy. Although both surge diverter and surge absorber remove the surge, the manner in which it is done is different in the two devices. The surge diverter diverts the surge to earth but the surge absorber absorbs the energy of a surge. condenser or capacitor surge absorber. inductor and resistance surge absorber. A condenser connected between the line and earth can act as a surge absorber. 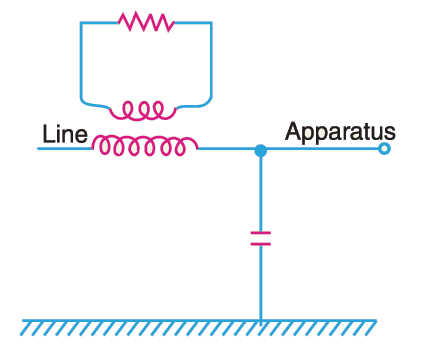 In Figure, a capacitor is used as surge absorber to protect the transformer winding. Since the reactance of a condenser is inversely proportional to frequency, it will be low at high frequency and high at low frequency. The surges are of high frequency, therefore, the capacitor acts as a short circuit and passes them directly to earth. However, for power frequency, the reactance of the capacitor is very high and practically no current flows to the ground. This type of surge absorber consists of a parallel combination of choke and resistance connected in series with the line. The choke offers high reactance to high frequencies (XL = 2 π f L). The surges have high frequencies therefore, are forced to flow through the resistance R where they are dissipated. It consists of an air cored inductor connected in series with the line. The inductor is surrounded by but insulated from an earthed metallic cylinder called dissipator. This arrangement is equivalent to a transformer with short-circuited secondary. 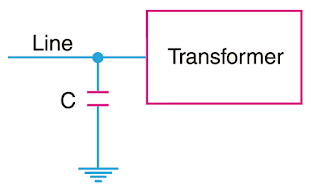 The inductor acts as the primary of transformer whereas the dissipator as the short-circuited secondary. The energy of the surge is consumed in the dissipator in form of heat due to transformer action. Generally it is used for the protection of transformers. Thanks for reading about ferranti surge absorber. © https://yourelectricalguide.com/ Ferranti surge absorber working.